Chubbies shorts — the kind of throwback, Martha&apos;s Vineyard-looking apparel that you&apos;d expect any guy from the University of Alabama to wear — has just gotten a special presidential endorsement. Recently, the Chubbies team sent a pair of their &apos;Merica shorts — shorts designed to look like the United States flag — to former President George W. Bush. The Chubbies team sent a personal letter and the &apos;Mericas to G.W. as a thank you for his support of veteran organizations. "In the letter we wrote to the president, we thanked him for his own efforts and contributions to veteran&apos;s causes, shared ours and thanked him for serving our country as president and Commander-in-chief," said Kit Garton, the PR and events manager at Chubbies. 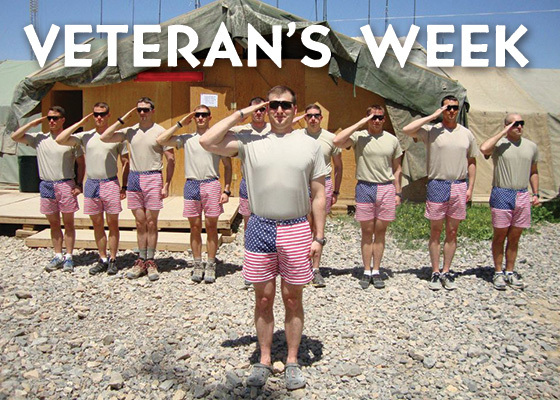 The company had just finished a special veteran&apos;s week campaign, donating $5-$10 to veteran and active duty charities for every pair of shorts sold, as well as telling the stories of Service members deployed abroad. "The main point of us celebrating Veteran&apos;s Week (in lieu of Veteran&apos;s Day) was to dedicate an entire week to honoring & giving back to our country&apos;s heroes – like Travis Mills and the men of the 9th Infantry Regiment – who are the reason we get out of bed and come to work every morning," said co-founder Kyle Hency. "To have President George W. Bush recognize our efforts was beyond amazing and is truly a highlight of our young company&apos;s history." &apos;Merica shorts, have been incredibly popular with U.S. troops, and have been sent to soldiers by the company as a special gift. "We often send shorts to veterans and soldiers and heroes as thank you&apos;s, knowing we&apos;ll never truly be able to show the depth of our gratitude, but hoping the shorts can represent even a small fraction of our thanks and appreciation," Garton said. Lets hope we see the former president in a pair of these some time very, very soon.